Well, the blog has that title, I wrote a book with that title–it’s only fitting that my last post for the foreseeable future should have it as well. I’d like to thank all my readers for their patronage, and especially those who have been commenters here. I won’t mention names, as I don’t want to leave anyone out, but you have made this a very rewarding experience. This blog will stay up, if it is of any use as a reference tool for you. So will its companion blog, 3000 Quads. And I’ll remind you that when the EIA finally publishes its International Energy Outlook, I’ll do a few brief posts analyzing it. Otherwise, I’ll see you all in the comments section of other blogs. Everybody’s tired of the climate wars. But not tired enough to quit fighting. This weblog is an attempt to differentiate some of us involved in the discussion from people at the extremes, those who hold either unwarrantedly skeptical views of what really is basic science or those who have let their imaginations run wild with apocalyptic visions of a future that the science does not predict. We are Lukewarmers. We’re not organized. There is no motto, no creed, no manifesto. We don’t meet, we converse infrequently and we don’t have a secret handshake. What we seem (so far) to have in common is an understanding that the basic underpinnings of climate science are understandable, well-grounded and not controversial, plus the growing realization that one of the key components of an extended theory of climate change has been pushed too far. That component is the sensitivity of our atmosphere to a doubling of the concentrations of CO2. The activists who have tried to dominate the discussion of climate change for more than twenty years have insisted that this sensitivity is high, and will amplify the warming caused by CO2 by 3, 4 or even 10 times the 1C of warming provided by a doubling of CO2 alone. Lukwarmers, for a variety of reasons, think it’s lower. 1. Tax CO2 at a starting rate of $12/ton and revisit the rate every 10 years, adjusting the rate to reflect changes in CO2 concentrations and a pre-agreed metric for climate change that has occurred in the interim. 2. Spend a global total of $100 billion for the transfer of technology to the developing world for the purpose of reducing the impact of development technologies, in hopes that they can leapfrog one or two generations of energy development. 3. Commit to spending over the course of this century on moving roads inland, removing permission for construction on threatened coasts and flood plains. The EPA found that this would cost about $400 billion for the United States about 20 years ago–adjust for inflation. But that’s a one-time cost. 4. Continue Steven Chu’s investment strategy for reducing costs in renewable energy, storage and transmission. Continue with ARPA-E at full funding. We may have another Solyndra–probably will, in fact. But we may also have another Tesla, which didn’t technically come from that program, but serves as an inspiration. 5. Encourage the U.S. EPA to regulate CO2 emissions from large emitters. 6. Accelerate permitting for new nuclear power plants to maintain nuclear power’s percentage of electricity at 20% in the U.S.
7. Uprate existing hydroelectric plants to take advantage of advances in turbine technology. 8. Mandate uptake of GPS within the air traffic control infrastructure and controlled and one-step descent on landing. 9. Homogenize permitting and regulation for installation of solar and wind power. Maintain current levels of subsidies and RPS. 10. Increase utilization of Combined Heat and Power facilities from its current 7% of primary energy production to the world average of 9% and then by steps in northern regions to benchmark levels found in Denmark, Holland and other northern European countries. 11. Support introduction of charging stations for electric vehicles. 12. Force existing coal power plants to meet best available technology standards or close. I sense a disturbance in the quality of the discourse. This is bad news for the blogosphere, but hopefully portends even bigger and better things for one of the most thoughtful writers on the Internet. Thanks for everything you’ve done to raise the tone, Tom. Help us Obi Brad Keyes-Nobi–you’re our only hope. Thanks for your efforts, they’ve been educational & thought-provoking. Well, it’s been an education–at least for me. I learned a lot–sometimes before I wrote a post, quite often afterwards… hmm. You have been successful. I hope you find time and will to restart this blog in the future. One way the extremists win is to wear out the reasonable people. Best wishes to you and yours. It’s been a hoot! Thanks for being my most faithful correspondent. Stay dry in Houston! Thanks! So long and thanks for the fish! It was nice to read your material. Many years ago I used to read “Turning Tables” a blog written by a soldier in Iraq. Eventually he returned to the USA, stopped writing. A year later he added a comment: “nothing turned out like I expected”. That was it. So, why don’t you come back once in a while and write a single line just to comment on whether things are turning out as you expected? Or you can visit my blog, which gets almost no comments, and drop a line. You’ve got a good blog, Fernando. I hope everyone here visits. What I think the climate world needs is for some really good writer to write the definitive history of the climate blogosphere, if for no other reason, that it is such a good story. Hint, .. hint. Hint… hint… hmm. When are you going to write this history? Actually, I think college kids will do dissertations for decades on the climate blogosphere. No need for us to pre-replicate their work. Well I have been trying to muster up an outline for The Canman’s Guide to the Climate Blogosphere, but I’m also shiftless, lazy, unfocused and absolutely world class when it comes to not finishing what I started. What, my efforts aren’t scholarly enough for you? Then I second Tom’s demand that you drop everything and write a better history yourself. And have it published on a reputable blog. It should only take you a couple of years… if, that is, you have the competence. Under Climate Rules, there’s no automatic right to criticize other people’s historical reconstructions—that’s a privilege afforded only to those who do an equal or greater amount of work themselves. Ha! Joking aside, there also needs to be a definitive psychopathology (or at the very least a DSM entry) dealing with the phenomenon whereby one team in a debate can spend 25 years making a single argument—that there is no debate—and wondering why they’re not winning it. is a profound question. Thanks for framing it so well. So long and thanks for all the blogs. 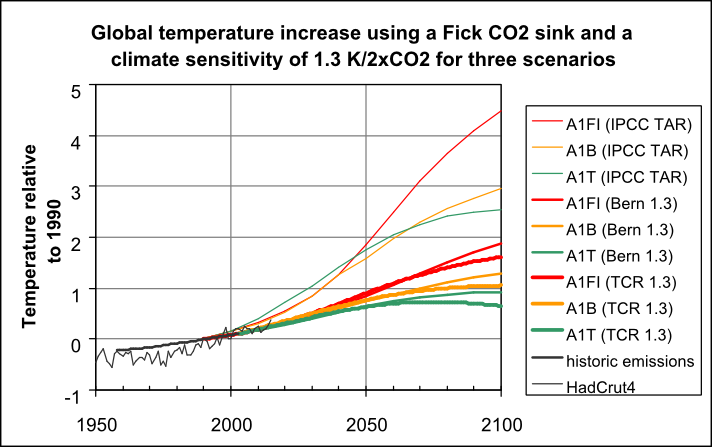 The goid news is that with the updated Lewis and Curry TCR of 1.33 we’ll have a lukewarm century, even with an unrealistic worst case RCP 8.5 emission scenario. Thank you, Tom, for what has been an interesting and informative blog. I do look forward to seeing your name appearing elsewhere, and hope that you will return to this site at some future date. (Best Schwarzenegger): Hasta la vista, baby–I’ll be back. Good Luck, we’ll meet again. …don’t know where, don’t know when… great song. I have enjoyed your blog and will hope to see you out in the blog-o-sphere occasionally. I sometimes blog here and there as RickA. Tom, is there any way to delete, and then in the future prevent, that pathetic pos Doug Cotton from posting here? His mental illness and delusions are on a par with the Robert Deniro of Flynn, the delusional loser who thinks he is one of the greatest writers in American history….who has never even finished a rough draft, much less been published. – Global average temperatures were 3 to 4 degrees C warmer than today (5.4 to 7.2 degrees F). – Polar temperatures were as much as 10 degrees C warmer than today (18 degrees F). – The Arctic was ice free. – Sea level was between five and 40 meters higher (16 to 130 feet) than today. – Coral reefs suffered mass die-offs. Actually I go with the 1,000 authors of the IPCC AR5 and all of the science academies on the planet. Between them the AGU and the APS have 110,000 members. That is just two of the 200 or so. I forgot something, Nyah, nyah, nyah!!!! !